Lot 31. Sicily, Syracuse. Second Democracy. 466-405 B.C. AR litra (11 mm, .71 g, 9 h). Under Hieron I, ca. 470-466 B.C. 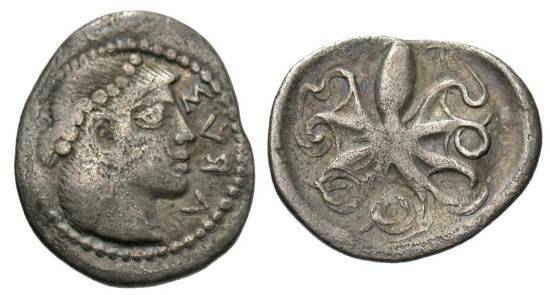 ΣVRA (R retrograde), diademed head of Arethusa right / Octopus. HGC 2, 1375. Toned. Fine.